Efficacy and benefits of soursop fruit is undoubtedly better to keep certain illnesses or medications. These reviews draw benefits of soursop fruit is definitely not want to miss. Soursop fruit or language latinya "Annona muricata L" is the fruit from the Caribbean Central America and South America. This fruit can be grown in almost all of Indonesia and the people call it the other side jackfruit, jackfruit lye (in Java), Java Sugar-apple (in Bali), Walanda jackfruit, soursop (in Sundanese), jackfruit buris (Madura), deureuyan Dutch (in Aceh ), Durio ulondro (in Nias), durian betawi (in Minangkabau), and others. 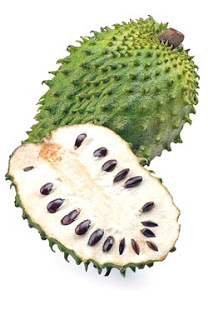 Origin of name soursop of the Dutch language is "zuurzak" which means sour bag. Beginning entry soursop fruit brought by the colonial Dutch in the 19th century and developed until now. From various studies that have been done, soursop fruit is composed of 67.5% pulp, 20% is skin, 8.5% and 4% seed fruit stems. And all of it is worthwhile for the body and can be used as health, the following benefits of soursop fruit based on its content. Vitamin C is a vitamin that is dominating soursop fruit, no research is that it tastes sour. However, the studies say as many as 20 mg per 100 grams of fruit flesh are all vitamin c. The content of this vitamin can be used as an improved immune system and peroses ageless, because the content is quite high in vitamin antioxidants. In the human body needs at least 60 mg of vitamin C every day so dukup 300gram consume soursop fruit, vitamin C requirement is met. Soursop fruit contained more minerals, but minerals are more predominant in phosphorus and calcium sebasar 27 and 14 mg/100 g. For a healthy pregnancy can help strengthen bone growth and bone thus inhibiting osteoporosis. In addition to the water in a soursop are also carbohydrates. Carbohydrates are manifold reducing sugar or glucose and fructose yield of 81.9-93.6 per cent of the total amount of sugar. Fat contained in soursop fruit is 0.3 g/100 g. In the amount of content a little soursop fruit is certainly very good for health. In the fruit also contained sodium (sodium) at 14 mg/100 g and potassium (potassium) is high enough so that 278 g mg/l00 benefits of soursop fruit can mencegahan hypertension. - Phytochemical compounds, these compounds are able to treat a variety of diseases such as gallstones, gout, constipation (hard money big water), and increase appetite. Benefits of soursop fruit can also be used to take the juice made juice. This juice can be used as an appetite increase which is common in children. And treat lumbar pain and pain, hemorrhoids, and so forth.